Belgrade, Serbia - In the Cathedral Church of St. Archangel Michae in Belgrade on the occasion of the Patron Saint's Day of His Holiness Patriarch Irinej of Serbia, on Lazarus Saturday, March 27, 2010 Patriarch of Serbia served the Holy Hierarchical Liturgy with the concelebration of Their Graces Bishop Vasilije of Zvornik-Tuzla and Bishop Longin of Nova Gracanica-Midwestern America, nine protopresbyters-stavrophors, two presbyters, three protodeacons and two deacons. The solemnity of the feast was enhanced with the prayerful chanting of the First Belgrade Singing Society. In an inspired sermon, Bishop Lavrentije of Shabac reminded all the present of this unique holiday. At the Holy Liturgy a great deal of the faithfull partook of Holy Communion, among whom the majority were children. 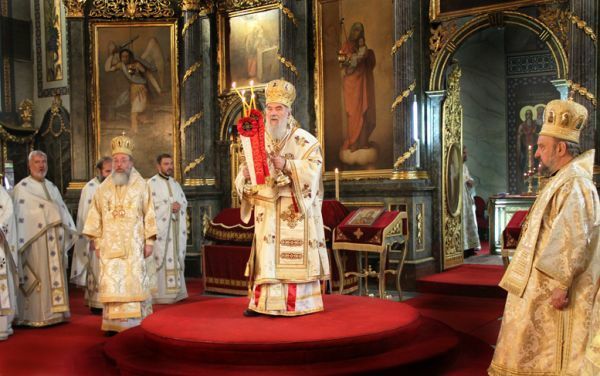 At the Serbian Patriarchate, after the Holy Liturgy in the presence of the host Patriarch, serving Bishops and Bishops who had come: Bishop Irinej of Bachka and Bishop Atanasije of Hvosno, as well as Minister of Religion Dr Bogoljub Shijakovic and Minister of Police Ivica Dacic, Bishop Lavrentije of Shabac cut the Slava Kolach congratulating His Holiness on his Patron Saint's Day and wishing that God grant him many years!